Natasha from Five Star Foodie kindly requested me if I could be one of her participants for a contest she is holding on her blog. I was of course extremely flattered but to be honest, most of the time, I tend to refuse those types of contests, because I am always concerned of not having the freedom to use what I want and obliged to use what I don’t want, resulting in a dish that is not really truthful to what I really enjoy. I was very happily surprised when I received a nice little package from Marx Foods with a lot of delightful gourmet ingredients. Basically, the theme of this contest is to take a traditional dish, twist it around and make it un-traditional while incorporating some of the ingredients from Marx Foods. After a lot of thoughts, I decided to go ahead and chose a very traditional and rustic French dish from Languedoc-Roussillon region called “cassoulet“, for the “connaisseurs” of French cuisine, this might not be unknown. It’s a white bean based dish cooked for hours, with a lot of different kinds of meats such as duck, goose, pork, etc…The beans are cooked for a very long time, resulting in unctuous beans melting in your mouth. 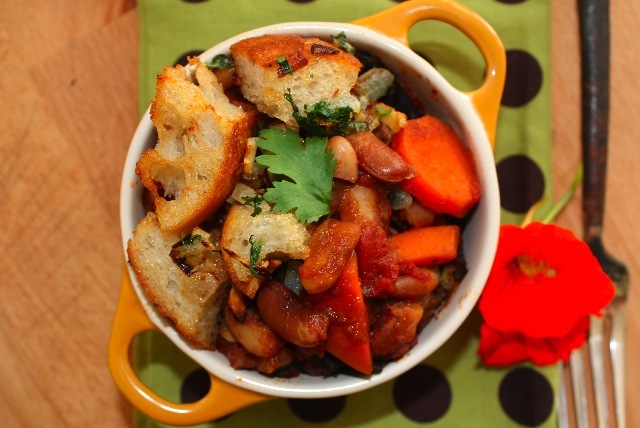 In this “Cassoulet revisited“recipe, I used beans…dried porcini, black trumpets, chanterelles mushrooms and flor de sal, all coming from from Marx Foods. I have to say that I prefer this vegetarian version (vegan) of the cassoulet than the traditional one which tends to be on the heavy side. The wild mushrooms add a rich and incredible woodsy flavor to this composition and will make carnivores forget that there is no meat in the dish. This is a very addictive meal, it’s hard to stop at the first bite, I almost ate the whole pot (and I am not talking about this tiny one on the picture) by myself. Go check out Five Star Foodie for the recipe…and let us know what you think! This entry was posted by silvia on August 30, 2010 at 4:39 pm, and is filed under Vegan, Vegetarian - dairy. Follow any responses to this post through RSS 2.0.You can leave a response or trackback from your own site. your cassoulet bowl is so quaint! this looks like a great hearty dish. i would love this dish with so many wonderful mushrooms included! Silvia, thank you so much for an amazing guest post! I love this delicious creation! Yum, that looks delicious. Thanks for the recipe. another delicious dish,full of aromas and colors! Cool idea – and the photo definitely makes me want it/ That’s smart to use mushrooms instead of meat – it’s totally true that they give a dish such a rich and hearty flavor it would be hard to miss the meat! Just came from Natasha’s. Great makeover Silvia! It sounds earthy and hearty meal with those 3 mushrooms. It’s true that we should adjust a certain ingredient/dish to a modern lifestyle. The dish looks so healthy too. Seemed like I’ve missed quite a few posts here but gladly I found the RSS feed button on your site! Just beautiful. I am always in the need of more vegetarian meals, and this one looks stunning. I can imagine that my friends would be thrilled if I presented this at our table. Her blog looks great, by the way! Silvia, this is simply gorgeous! Will hop over to check out the recipe. Thanks alot. Hope you’re having a wonderful day. Awesome! Hoping over for the recipe! Silvia, such a tantalizing dish for fall! I’m keeping this recipe for the first really cool day! Silvia, that’s very kind of you! Thank you so much for your offer. I’ll let you know if I needed anything in the future. Promise! Thanks a million for everything, dear friend. Went over and checked it out….looks delicious, Silvia! Silvia…you took on a challenge and succeeded where some people would have found themselves stumped! Great on you for creating such an interesting turn around. 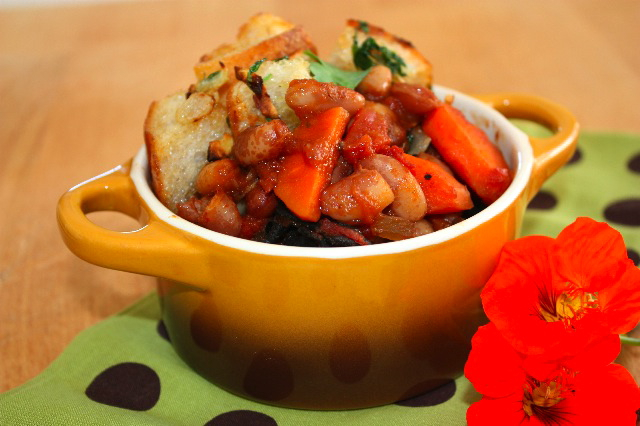 I think that I would like this vegetarian version of cassoulet, better than the traditional! Mostly because I’m imagining the wonderful flavors of the trio of mushrooms. Great rendition! I *adore* cassoulet–the traditional kind with big pieces of meat–had a wonderful cassoulet last time I was in Paris. But admittedly it’s not a dish for every day. This looks much lighter and healthier, but still I’m sure very tasty!